We are so excited to announce that Papertrey Ink will be getting a fresh start! While we can’t share our exact plans just yet, we will keep you updated with more information in the weeks to come. In order to implement all of the changes we are making, we will be taking time off of releasing new products in order to reduce our huge inventory of over 5,000 active items. Starting February 1st at 12 AM ET we will be offering 15% off of most items in our store until February 8th at 11:59 PM ET. 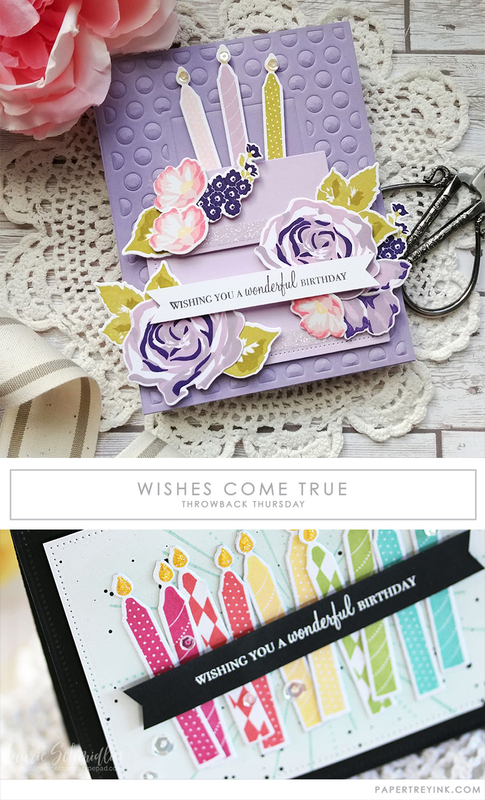 Over the next couple of months expect to see great promotions on many Papertrey Ink products, you might even see some of your favorite retired items return for a limited time! We have received tons of emails asking what aspects of Papertrey will remain the same. Please see below for more information. You will be able to keep all of the rewards points you have earned and the rewards point system will remain intact moving forward. Any gift certificates you purchased in the past, as well as any you purchase now or into the future, will remain active until redeemed. All cardstock colors will remain the same. All ink colors will remain the same and we will continue using the same dye ink formula. Many of the current staples you love to purchase at Papertrey will continue to be available. We know this announcement may not have knocked your socks off, but as we reveal more information, we know that you will be excited with the changes that were inspired by all of your fabulous suggestions over the last 12 years! Thank you so much for all of your support, we are so grateful to be a part of this amazing community that is more than just stamping, we’re making a difference…one paper craft project at a time. Does this mean the dies we have been told will be restocked will not? Example… the winter, spring and summer berries? I feel like I have been lied to. I contacted Papertrey before I ordered the Gathered Garden stamp set & was assured the die set would be back in stock so I ordered the stamps. That’s better than ordering the dies but not having the stamps! I have done that on occasion! I personally don’t think they will be refilling any of these sets. After all that would increase their inventory. And they are postponing any new release much less an Anniversary set. But the worst is that the majority of things in my Wish List are still out of stock. Oh well! At least they are confident of their new direction! Was this was their really big announcement? A fifteen percent sale is hardly an incentive when the rest of the industry routinely gives 20% to 25% off. I’m happily moving on to Ellen Hutson and My Favorite Things! And those are just a couple of the great companies out there! Susie, I’d like to politely comment on one point that you made. A 15% sale at PTI is a wonderful incentive for many of us, especially when considering PTI’s prices. They are substantially less than the industry standard, even when you take into account the “routine” 20-25% off sales. I will give you that the discount would be better if all items were in stock when the sale began, but I’ve run into that at other companies, too. My guess is that it is challenging to keep inventory when demand for brilliantly designed product runs high. Very well said Nancy. I too have found that PTI has great prices and love their annual sales. Thank you for your spot on comment. I have the same question. I’ve been waiting a long time for certain dies. Has PTI been sold to another company? Can you comment on shipping for Canadians? Currently, the cost is outrageous and other competitors are offering affordable flat rates. I hope you make some changes in this regard. I absolutely agree with this one! I also agree with this! I agree. I love PTI, but the cost of shipping is so high to Canada. So I only make a larger order once a year, when I can find most of my wish list in stock. But its best that way, as I have to get a bit more creative with my supplies. And although there is a lot of great companies out there, Make it Mondays and the forum here is amazing. I learn so much from entering the challenges or trying to play along. When will the new releases resume? I will miss them! I’m hoping the dies I have been waiting for will be restocked. From here on out I will not buy the stamps if the dies aren’t available at the same time. Lesson learned. Agreed. Sale or no sale. I’ve been doing this for awhile now, because we’re being kept in the dark about this issue. Is this one of those scenarios where a store “closes for remodeling”, with sales and discounts beforehand- and never opens again under that management? It has all the signs, like finding retired items in the warehouse. Having a good management team, who are open with their loyal customers, would have answered all these questions. Change is hard! Cheering for you! I’ve enjoyed/appreciated this company for many years, looking forward to what the future will bring. This was the BIG announcement we have been waiting for… really!! I would assume you are not having a new release because most of your product designers have left. I have the same question as others. Will items be restocked for this HUGE sale? This announcement seems like a continuation of what we have been hearing for a year or more… empty promises. I am trying to be thoughtful and polite but it is increasingly difficult as you seem to find it difficult to be open and honest with your faithful customers. Looking forward to the new changes and can’t wait to see what it brings! All the dooms-dayers and Debbie Downers are invited to leave and search elsewhere for their needs. I for one, am still a loyal PTI customer and will continue to buy their products as long as it suits my style. Change is inevitable! I am heading into this new direction with PTI! Curious about restocking items. Should I continue to watch for restock notification? Does this mean stamps and dies will be discontinued? It’s always nice to see your smiling faces! I look forward to seeing some tutorials and ideas for when I receive new items – I always print out the “tip” section when I’m getting ready to place an order. Glad to also get 15% off – that’s one more item from my wish list that can be added to my cart!! Thanks for inspiring! I love PTI Stamps. Your company is almost exclusive to where I buy my stamps. I must say I was disappointed to see a few of your current designers leave. I hope that your new designers can still serve my needs. If not, I’ll be a lot richer in the end, lol! Will we have to wait until your inventory reaches a certain level before we something new? I little more information as soon as possible would be much appreciated. Well the sale is nice but I am still very concerned about who you’ll be getting as your new designers! This will determine whether I will stay with PTI or not. I have been a long term customer for over 10 years. And I have enjoyed the products of the old designers. Needless-to-say, you have a BIG task finding their replacements. I really hadn’t planned on quitting the whole stamp/cardmaking hobby. This makes me very sad to think that I might because of all the changes. Please provide more info about the new designers. I am assuming there will be no February release!? Also, I agree with previous comments about provding better shipping rates (flat rate)! Thanks for listening. I gave up on Papertrey some time ago…..as for this ‘announcement’ video – Ashley seemed to be doing her best to be frank and honest but Julie was anything but – so shallow – really, does she think she can hoodwink all of you all of the time? I always said that if Betsy went then it would be more downhill all the way….and it has already been downhill for a long time. Oh yes there are still loyal folk but sadly they are kidding themselves. As another poster says there are lots more companies out there, now, that have equally good quality items and they will be winning hands down. Guess this post won’t stay up for long. I am so glad I am not related to you. Well, I guess I knew it was going to happen… of the five stamp and die sets I was going to buy, NONE of them had the matching die in stock. So typical. I don’t know why I got my hopes up. Thank you for 12 great years of products! I appreciate the discount. Happy Anniversary! Please know that despite some of the negativity there are many of us that still believe in your products and ability to provide unique products to those that love this hobby. And please while you are working on things, please work on the indexing of your website. The catalog is so difficult to navigate and when one does put in a key word, there are sooo many unrelated items that appear. Not user friendly in the least…many steps behind most of the other stamping companies. PTI team- I feel that this was very anticlimactic. We all expected the sale per usual. So that leaves your huge announcement to be that we have to wait for the huge announcement. I feel that your choice has left many people with a sour taste in their mouths. Many crafters reading this have been devoted fans from your inception, and I am sure they feel like they deserve more then this. I would have to agree. I do not understand why you thought it was a good idea to make a huge announcement and then not tell us anything. If you can’t speak to the changes behind the scenes, then don’t bring it up. Make the necessary business decisions, get things moving into the direction you plan on going, and once you can ACTUALLY IMPLEMENT the changes, then you make the huge announcement. You have done nothing but create (unnecessary) negative speculation about what is going on. Face it people will assume the worst when given NO details. Especially after 95% of the designers the customers where here for are now gone. None of this leaves a good feeling in peoples stomachs. I for one have been here for 2 years and enjoyed the designers who left. So I am unsure, but optimistic about future offerings. I really do hope that designers who remain or new to the team can maintain and improve the high level of offerings we have come accustom to. If you think that education needs to become the forefront of your business, why? What have your designers and design team been doing for the last 12 years? What has this blog and your YouTube channel been? I am afraid that you are focusing on the wrong problems with the way you do business. We have asked for better website, more quantities on hand, faster restock timelines, cheaper shipping (or lowered threshold for free shipping). I can’t say that I have heard much chatter about more education. But that is me. I wish PTI nothing but the best and a successful future. I shall remain cautiously hopeful. Hello all! I want to chime in for some reason. I’m usually one who doesn’t make waves and sits back without interfering. But, I must this time. I can’t believe how much negativity and pettiness there is behind the computer screen. Why not accept the announcement for what it is and be positive and optimistic about what the future will hold? I am excited for PTI and whatever changes are coming. Yes designers have moved on, but that’s part of life. I would love to wish them all well in their endeavors but certainly wish PTI luck instead of failure as well. Where has kindness, goodness, civility, and optimism gone? I must say that the increasing and continuing pettiness put forth by many PTI customers is disheartening and wears me right out. Why can’t we lift and stengthen instead of tear down and destroy? I’m sticking around am so thankful for the positive thoughts and comments shared. Life’s way too short to pick others apart. Thanks, Melissa. I hope your good health returns so you are able to inspire us as we enter this new season. Thank you, Melissa! your post outshines all the negativity. You and your projects are beautiful! Thank you so much for your comment! Hope you are feeling better and am looking forward to seeing you back with your amazing designs on PTI!! I reply to your comment but did not do it this way. You can see it at the bottom of the comments. Please take some time to read it and I apologize for some grammatical errors that went over my head. Thank you, Melissa, for your encouraging words, and even for your gentle scold. I think customers will be reassured knowing you are staying–and even engaging in this conversation. The pettiness comes from fear, I’m sure. New beginnings are scary…but necessary and exciting. Thank you for the sale! I was able to purchase some dies and inks that I had been putting off. I am excited about what is to come. I have worked in catalog/ ecommerce businesses for over 20 years and understand the constraints of too much inventory. I am excited to hear about the plan for more tutorials! I see it as a wise decision to hold off on introducing new product for now until the inventory can be cleared. One of my favorite PTI spots is the “Throwback Thursday” and several of my purchases have been of old sets for which I have gained new inspiration through these posts. To the current designers and artists – please do not be disheartened by all the negative posts. I am looking forward to seeing “Whatcha got”! Creating is a continuing journey for the bold who are not afraid to fussy cut when they don’t have the matching die set. To the designers who have moved on – THANK YOU! for all the hours of I have spent enjoying your creations! Being a long time customer, you continue to have my support. I can’t wait to see what great things the upcoming changes bring. I have quite a lot of PTI items and love them all. Anyone in business is allowed to make changes. It is THEIR business. I sure do appreciate this sale, even though I know that their normal prices are already the best on the market. And NO business OWES anyone a sale. (especially if they already have good prices). Anyhoo, I sure do wish PTI the best….. Thanks for the great sale!!! I’ve spent way too much and got everything I wanted and more!! I will continue to support you and look forward to seeing what you have to offer in the year ahead. Thank you so much for the sale, I really stocked up on cardstock!! Can’t wait to see what’s coming to PTI; hang in there not everyone likes change! Happy 12th ANNIVERSARY PTI!! You are absolutely my favorite crafting company and I can’t wait to see what the future holds for you, your current designers and new designers. I am super excited to see all the new products in the coming months. Also, thank you for the incredible anniversary sale!!!! I was able to pick up the items that had been sitting in my cart for a few months. Again, Happy Anniversary to an incredible stamp/die company!!!! I can’t believe how much inventory PTI has, especially compared with other card making companies. From a business perspective, especially buying a new company their can be a lot of debt to the new owner. Having lots of inventory ties up precious resources. They really do need to reduce the inventory and just keep a few oldies but goodies. PTI to have the variety is does and 100’s of dies and stamps in stock is amazing! (FYI – SSS never has all the items I want to purchase in one order as well.) Inventory is very expensive to hold. I think its a good direction for PTI to go. I just hope my favourites I haven’t purchased are ones chosen to be kept. But if not I have so many wonderful dies and stamps that need more love. And the prospect of new and exciting products to come. ALL THE BEST PTI. thanks for the sale. Great prices and great products. I am so excited to see what PTI has in store for the future. I have loved PTI from the very beginning and will continue to LOVE PTI. Their products are amazing, have great PRICES and their designers are amazing! Thank you so much for having a great sale. Totally understand you have to reduce inventory. Every company has to discontinue older items to make way for new. Great luck and success to all the designers past and present. You are all amazing. Can’t wait to see the next chapter for PTI. So sad to see such negative responses from customers! Please support them not tear them down! I cant wait for tutorials. I hope Melissa Phillips will share her tips and tricks on video. I love PTI dies! I want to comment on Melissa’s comment. I understand where you are coming from, and I know you are a gentle soul. Having said that I don’t view these comments as petty, there is a concern underneath all these comments and I agree with them. That there has been signs of misleading and half truths. When THE TOP DESIGNERS and the previous owner of a company go out almost at the same time, although they have assured us that it has nothing to do with the new administration, it is a very hard pill to swallow. I cannot understand for the life of me if these designers were so talented and versatile, how come they are not included in this renewal or renovation of the company. As far as I am concerned they SHOULD have been THE ONES to count on for this renovation, because they KNOW the company that well, I really do not believe the statement from Julie that they are going to emphasize on teaching, just for the fact that exactly THAT was what these designers had been doing with the Make It Monday, the you tube videos every time Betsy had a genius release of hers letting us visually know how to use these products, and all the other tutorials, there is something amiss and frankly I don’t appreciate pulling the wool over my eyes. There is a saying from Judge Judy that goes what is not logical cannot be true. Having owned businesses all my life if you have someone excellent, you try to stick with them the longest, I would have bend over backwards in order for them to stay, as I stated on a precious comment, LOYALTY is a great thing to have and to give! On top of that I have had not so good and I might add a terrible experience once, with Customer Service. First I cannot understand why the minimum shipping for Puerto Rico which is a Commonwealth of the US is $100.00 when for the mainland is $80.00, it costs the same to ship a package to Puerto Rico as say for example Iowa or Miami. I ordered some things for this sale but once again they had items out of stock that I already have the stamps for. As for the changes it is unbelievable that for YEARS, every time there is a release we have to wait hours for the order to get through because the site crashes every single time. I see no purpose in getting e-mails for the products that I want being restocked if I either have to order $100.00 for the shipping to be free or pay $7.00 or more to order one or two items. When PTI had the big sale that had ribbons and buttons for $1.00 , I order a lot but was missing two ribbon colors and I was accused by Julie after telling me that they would refund the money but stating that she couldn’t believe how this happened because they had a great team on the shipping department, so I guess I was milking them for two dollars? Give me a break! These are the things Melissa that we as customers have had to deal for years believing in good faith that they would improve, that customer service would be emphatic to the plights of the clients and not to make them feel as if every time it was our fault or we were lying. I TRULY believe that behind every single comment including mine there is no pettiness, it is the fact that we have been expecting things for so long that we are FRUSTRATED by the stillness or slow pace that these changes are coming. I think that we expressing our opinions truthfully basing it on our experiences as customers is for them to take this constructive criticism and full heartedly take inventory to see where PTI can and should improve. I am so glad that you are staying, nobody myself included wants PTI to flounder, my first order was on 2011 up till today, in spite of all the problems I have had. My orders used to be $200.00 to $300.00, ever since I started feeling not as a valuable customer, my orders started to dwindled because nobody wants to be unappreciated as a customer. And the main reason that I kept buying from PTI as I wrote in the email that I send Julie was that I am going to be 70 years old this July, I won’t deny myself a little bit of happiness wherever I can take it, but most of all I stayed BECAUSE of the TALENTED DESIGNERS from Betsy to Dawn to Nichol to Lizzie to Heather and card designer that elevated my spirit and let my talent soar as the previously mentioned and yourself. my Goddess of Whimsy! I hope that this gives you another perspective because every single one of us is a customer of many things in life, and we ALL want to be treated as a VALUABLE one every single time! i am so sad to see all these negative responses from all these customers. PTI has been nothing but very polite and with outstanding service to me since 2008 when I started purchasing their unbelievable products. For example, I lost a tiny beak and feet stamp to my Brushed Birds set, and contacted PTI Customer Service about ordering a new set. They told me not to order the whole set and they sent me a brand new beak/feet stamp that I had lost without any cost to me whatsoever. It took a little time to receive it, but after all, a new one had to be made and I was so happy to have it again. This taught me a lesson to be more careful with my stamps. I placed two orders on January 31, 2019 to restock several 50 sheet packages of paper and ordered several ink pads and refills that I either did not yet have and some that I needed to replenish not realizing there was going to be a 15% sale the very next day. I did not feel aggravated when I woke to the sale prices, I chose several other items that I had on my wishlist and placed another order taking advantage of the sale prices. I was tickled to purchase some of the items I had been wanting for some time at a lower cost. Some stamp companies retire the majority of their stamps annually to cut down on the huge inventories. I have enjoyed PTI keeping so many of their popular stamps for a long time so I could purchase my favorite ones over a period of time. Another positive note is the shipping time from the time that I place an order to the time I receive it has really improved and I even received one order in about 3 days, which I think is fantastic. Any time I have a question, I post it on the customer service site and have always received an answer in 24 hours or less. Julie has even answered my questions during a holiday time and even several times over a weekend, or late in the evening. I really look forward to some tutorials to see how the complete cards are made. I really love Melissa Phillips’ tutorials because she starts from the beginning and takes you through the complete process. The remaining ladies who present their inspiring ideas each month are so appreciated by me. They have such outstanding ideas to show us how to make some beautiful products to give to our friends and loved ones. I will always be loyal to my PTI Product Designers and Design Team Contributors. They are the greatest. I will miss the ones who have already gone very much and I will look forward to the new ones who will soon be coming. Best of luck in the future, dear Papertrey Ink!